Check out our running list of The Best SNL Sketches of 2017. Update: Shortly after complaints about the sketch, NBC removed existing video on YouTube and NBC.com. You can probably hear the jingle in your head: "Safelite repair, Safelite replaaaace." Now imagine if the theme song to everyone's favorite automotive glass and claims management company induced memories of being hassled by a total creep. Can't? Don't worry, Saturday Night Live is here for you. 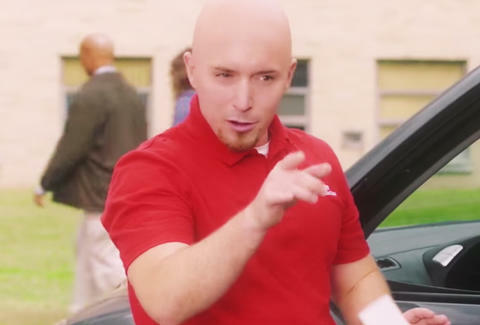 In one of the most uncomfortable sketches of the modern age, this week's SNL featured a bald Beck Bennett as a member of the Safelite AutoGlass crew, ready to help out a mother (Aidy Bryant) and her teenage daughter, Lainie (Melissa Villaseñor), who find themselves plagued by cracked windshield. Eventually, they also find themselves plagued by the Safelite AutoGlass guy. After a back-and-forth in the high school parking lot, the Bennett's Safelite guy asks if the daughter plays center for the basketball team. He guessed correctly. "You must be tall for your age," he says. "Laine's 17," says the mom. "So... basically a full woman." The faux-commercial only descends into greater madness, and if you're down with cringe humor, you'll dig the sketch. Several people who did not enjoy it? The masterminds behind Safelite AutoGlass' Twitter feed. Somehow, this bit got even more awkward. To be clear, for the many Safelite fans who flocked to social media to express dismay to the beloved brand, no, the company had nothing to do with the sketch. We weren't involved in creating it and we're really disappointed in @NBCSNL for airing it. Wes Rendar's favorite SNL cast member is Gary Kroeger.